Congress faces a funding deadline this week as lawmakers scramble to sort out what policy riders will make the fiscal 2018 omnibus appropriations package. Lawmakers will need to pass the bill no later than Friday, when a temporary funding measure expires. If they fail, many federal agencies would be forced to shut down at the end of the week. Negotiations that extended through the weekend were expected to lead to an agreement being announced by tonight. The House would go first and then the Senate in clearing the bill for the president's signature before a two-week congressional recess begins. The "money side is good, but there are all kinds of other things that are still floating out there," Sen. Lisa Murkowski (R-Alaska), the chairwoman of the Senate Interior, Environment and Related Agencies Appropriations Subcommittee, said last week. A budget deal approved by Congress earlier this year gives appropriators an extra $200 billion in discretionary spending during the next two years. That bipartisan accord is likely to allow lawmakers to sidestep proposed cuts to U.S. EPA and certain programs for the Interior and Energy departments. Murkowski and other appropriators have said the final haggling concerns add-on policy provisions, known as riders. Ultimately, the most contentious of those are likely to be resolved by top leaders in the House and Senate. Environmental groups have warned that more than 80 riders are in play, including provisions that would gut the Endangered Species Act and allow the Trump administration to move ahead with rolling back several Obama-era clean air and water protection rules. However, Rep. Ken Calvert (R-Calif.), the chairman of the House's Interior-EPA spending panel, said late last week that especially contentious proposed riders blocking the Clean Waters of the U.S. rule and delaying ozone emission standards may not be needed with a Republican administration. "Scott Pruitt's handling that and the ozone issue," said Calvert, referring to steps the EPA chief has already taken to scrap the WOTUS rule and slow-walk ozone standards. Environmentalists are especially worried that Murkowski will be successful in championing provisions seeking a new rule management plan for Alaska's Tongass National Forest and rolling back roadless rule protections in the forest. They say both moves would favor loggers. Greens are also concerned Murkowski is pressing for a provision to potentially reverse a federal court ruling that gives the federal government the authority to restrict hovercrafts on a section of the Nation River in the Yukon-Charley Rivers National Preserve in Alaska. The case, brought by Alaska moose hunter John Sturgeon, has attracted national interest and is seen as a pivotal test of the wider issues of access to public lands and who has authority over millions of acres of land in Alaska. Sturgeon is appealing the decision to the Supreme Court. House Republicans, meanwhile, are pushing to include a provision that would facilitate a massive water infrastructure project in California, even though the state has said it doesn't want it. The proposal would allow the federal government to pay for the early phases of raising Shasta Dam in Northern California, a move that would be certain to face a legal challenge from the state. 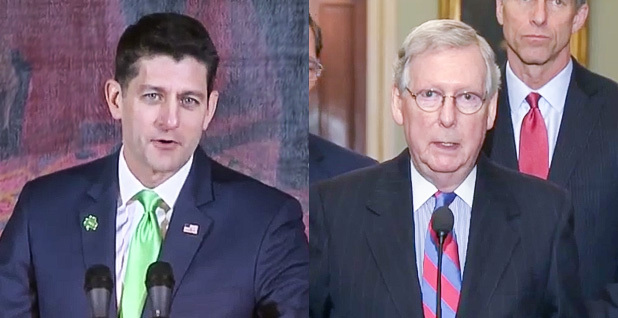 There's also a chance expired energy tax breaks could be extended under the omnibus, although House Republicans are deeply divided on the issue and it may remain unsettled. Backers of NOAA are already looking beyond the omnibus to the next funding fight. Democrats made the case last week for Congress to fully fund the agency, which is facing a nearly 20 percent cut under the administration's fiscal 2019 budget. 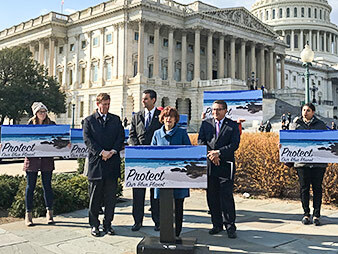 "Calling on the Appropriations Committee for funding NOAA, ocean acidification, and more research and monitoring programs is something we should all agree on," Rep. Suzanne Bonamici (D-Ore.) said during a press conference. The budget would slash more than $1 billion from NOAA's funding level, dropping it to $4.56 billion. Rep. Don Beyer (D-Va.) defended financial support for NOAA's Coastal Resilience Grants program. He said last year the program received more than $135 million in grant proposals, but NOAA only had $15 million available for funding. Rep. John Sarbanes (D-Md.) added that NOAA plays an important federal role in cleaning up the Chesapeake Bay. He said the bay program has shown "incredible progress" in recent years. "It would be crazy to start disinvesting in the Chesapeake Bay program at this point. ... We're accelerating the progress in terms of cleaning up the Chesapeake Bay. NOAA is part of that," Sarbanes said. Reporters Geof Koss and Cecelia Smith-Schoenwalder contributed.